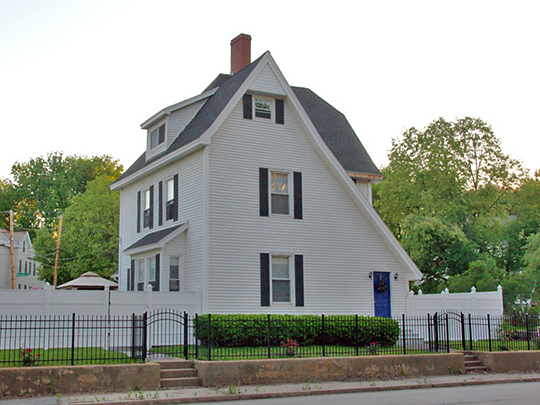 Photo: Home in the Historic Mill Housing District E, McGregor Street, Manchester, NH. The Historic District was listed on the National Register of Historic Places in 1982. Photographed by user:Magicpiano (own work), 2012, [cc-by-3.0 (creativecommons.org/licenses/by/3.0)], via Wikimedia Commons, accessed March, 2014. Hillsborough County Offices are located at 329 Mast Road, Goffstown NH 03045; phone: 603-627-5600. Incorporated in 1771, Hillsborough is named for the Earl of Hillsborough, one of the privy council of King George III. It contains [in 1881] 31 towns, 10 having been incorporated in the reign of King George II, 12 in the reign of King George III, and the remainder by the government of New Hampshire. It is situated in the southern central part of the State, in the beautiful valley of the Merrimack. The county is noted for its beautiful and historic rivers, which have contributed much of its relative importance, in respect to wealth, character and influence. The Merrimack Valley, with its flowing streams and fertile vales, became, from the first, an object of interest to the white man, as it had long been to the Indian. As early as 1652 it was explored and surveyed by Captains Willard and Johnson, under the patronage of certain parties in Boston, who laid open to the eager gaze of the adventurer its rich basin and valuable fishing grounds.